Amazon Price: $150.00 $106.95 You save: $43.05 (29%). (as of April 23, 2019 8:08 pm - Details). Product prices and availability are accurate as of the date/time indicated and are subject to change. Any price and availability information displayed on the Amazon site at the time of purchase will apply to the purchase of this product. 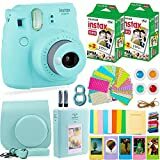 ❤ Fujifilm Instax Mini 9 Camera in ICE BLUE: Perfect instantaneous print video camera for anyone from photography beginners to sentimental pros. ❤ 2 Twin Packs of Instant Film: Start capturing as quickly as the minute strikes, with sufficient movie for 40 Photos! ❤ Travel Camera Case + Adjustable Strap: Keep your electronic camera secure anywhere you opt for lovable free-open-close case. ❤ 64-Photo Album: Protect your favored shots from dirt, particles, and also damage with a cd that's also adorable as well as portable. ❤ Selfie Lens: Capture the ideal selfie every time with your practical close-up lens! ❤ 4 Colored Filters: Adjust the tone, contrast, as well as illumination with user friendly filters. ❤ 10 Hanging Frames: Reusable, vibrantly colored structures look excellent hanging on any kind of wall you choose! ❤ 10 Clips + String: Display the hanging structures for parties or individualized house decoration in seconds! ❤ 60 Sticker Frames: Make your photos even more enjoyable by embellishing them with vibrant sticker label designs. ❤ 5 Stand-Up Frames: Turn any kind of surface right into a photo display with vibrantly colored plastic frameworks! ❤ Microfiber Cleaning Cloth: Keep whatever from your lenses to filters glossy and also working fresh! The best gift for your fun-loving family and friends! View the fun unravel as soon as they unwrap their new bundle! Make every minute one to keep in mind when you offer this as a birthday celebration, holiday, or congratulatory present. Plus, our 90-day refund assure lets you purchase with comfort. If it's not love at first shot, simply call us for a complete refund. Break this deal up before it's too late by adding one to your cart TODAY!